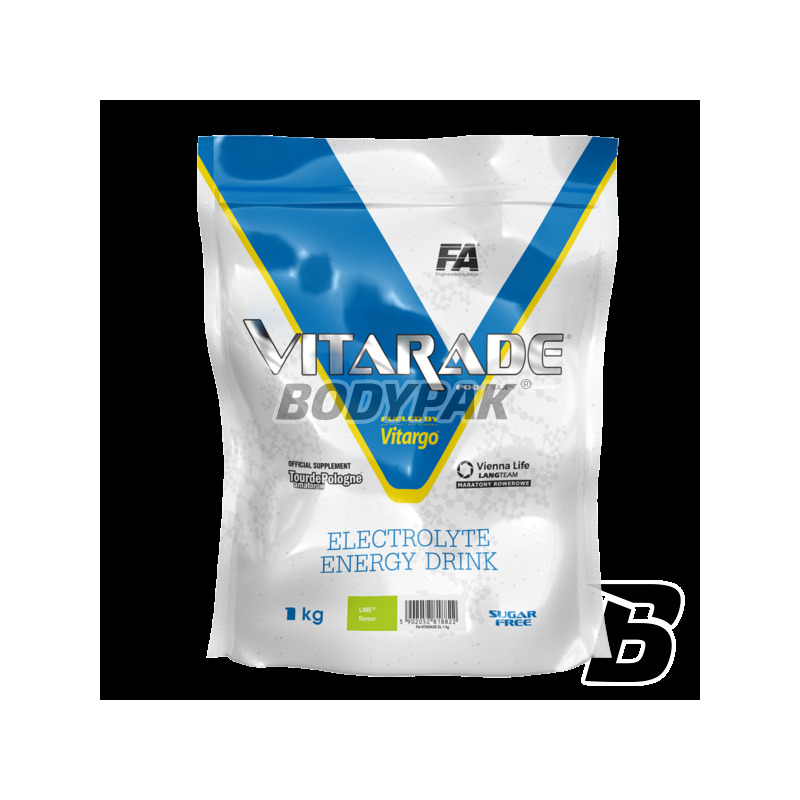 FA Vitarade EL fueled by Vitargo® - was created with the aim of leading high-performance athletes to ensure that they can effectively absorb most readily available energy accumulated in the form of muscle glycogen. During intense exercise causes increased muscle blood flow, allowing more oxygen and nutrients may be supplied to the working tissues. This happens at the expense of reducing the blood supply to the gastrointestinal tract and results include a reduction in the speed of passage of gastric contents through the stomach and intestines, as well as an increase in sensitivity of the digestive system on residual food. In order to optimally carry out training or effective participation in sports competitions, must continuously provide carbohydrates (the main source of energy), as glycogen in muscle and liver rapidly diminishing even during physical activity of moderate intensity -3,4,5. In addition, a very important factor in exercise capacity in training or competition is proper hydration. Already 2% loss of body weight caused by dehydration leads to a reduction in efficiency by 5-10%, while 4% of weight loss reduces the capacity by as much as 20-30% (!!!) 6. Providing adequate amounts of fluids during exercise to prevent dehydration delaying the moment of the appearance of fatigue. Vitarade® EL fueled by Vitargo® provides instant source of easily digestible energy while effectively irrigating the body, thereby minimizing the risk of sudden fatigue of the body. To meet the needs of all physically active people, including professional athletes, Vitarade® EL fueled by Vitargo® provides high molecular carbohydrates, which in contrast to the usual drinks based on maltodextrins and simple sugars, quickly empty stomach without causing a feeling of fullness, heartburn, etc. During exercises. Vitarade® EL fueled by Vitargo® is a perfect formula for anyone who has ever experienced gastrointestinal problems during training, sporting events, or everyday activity, caused by the consumption of a typical carbohydrate drinks. Carbohydrates contained in Vitarade® EL fueled by Vitargo® not remain in the stomach, so you can quickly be absorbed from the intestinal lumen into the bloodstream acting instant source of energy for working muscles. In addition, Vitarade® EL fueled by Vitargo® contains a minimal amount of additives. As a result, people with particularly sensitive digestive system, which previously could not eat any carbohydrate products, will be able to feel the incredible energy boost also during training or competition without any effects. Vitarade® EL fueled by Vitargo® is a source of 4 main body of electrolytes (sodium, potassium, magnesium and calcium) responsible, among others, for maintaining proper water balance (hydration) of the organism, neuromuscular contractility or muscle cells. Optimally balanced proportions allow the replenishment of losses occurring through perspiration during exercise. Consuming Vitarade® EL fueled by Vitargo® reduces the risk of muscle cramps enabling efficient execution of even the most intense and prolonged training, take part in competitions, and team competitions. Vitarade® EL fueled by Vitargo® is also an ideal solution for all those people who sweat heavily during physical exertion at high temperatures, or looking for a beverage having the properties simultaneously energizing and irrigation. 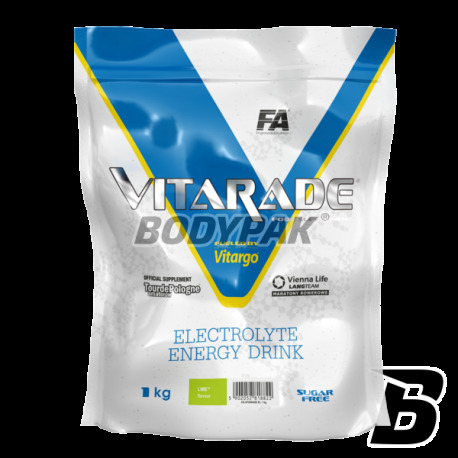 The content of macromolecular carbohydrates, low osmolality of the solution and optimal proportions contained electrolytes cause that Vitarade® EL fueled by Vitargo® also hydrates and nourishes the body.
. Piehl Aulin K., Soderlund K.. et. al. : Improved gastric emptying rate in humans of a unique glucose polymer (Vitargo). Scene J. Gastroenterol 2000, 35: 1143-1149.
. Piehl Aulin K., Soderlund K.., Hultman E.: Muscle glycogen resynthesis rate in humans after supplementation of drinks containing carbohydrates with low and high molecular masses with gel-forming properties (Vitargo). Eur. J. Appl. Physiol. 2000, 81: 346-351.
. Romijn J.A., Coyle E.F., Sidossis L.S., Gastaldelli A., Horowitz J.F., Endert E., Wolfe R.R. : Regulation of endogenous fat and carbohydrate metabolism in relation to exercise intensity and duration. Am. J. Physiol. 1993, 265; 380-391.
. Romijn J.A., Coyle E.F., Sidossis L.S., Rosenblatt J., Wolfe R.R. : Substrate metabolism during different exercise intensities in endurance-trained women. J. Appl. Physiol. 2000, 88; 1707-1714. . van Loon L.J.C. : Use of intramuscular triacylglycerol as a substrate source during exercise in humans. J. Appl. Physiol. 2004, 97; 1170-1187.
. McArdle W.D., Katch F.J., Katch V.L. : Exercise physiology. Energy, nutrition and human performance. 6th Edition. Wolters Kluwer/Lippincott, Williams and Wilkins, Philadelphia, 2007. During exercise, as a drink: 1 serving dissolved in 600 ml of water. During prolonged exercise: 1 serving dissolved in 600 ml of water and consume during every 45 minutes of effort. Strength Training: 1 serving dissolved in 400-600 ml of water and consume during every 45-60 minutes of effort. Team Sports: During the match drink 1 portion dissolved in 400 - 600 ml of water for every 45 minutes of the match. During everyday activities, as a carbohydrate drink: 1 serving dissolved in 600 ml of water and consume during every 45 minutes of effort. regeneration following exercise: 1 serving dissolved in 400 ml of water or milk directly after the workout. Ingredients: Corn starch (Vitargo) 96%, citric acid - acidity regulator, flavors, potassium citrate, sodium chloride, magnesium citrate, beet juice concentrate-4.11, sweetener (sucralose), coloring (E104 [1.2. 4,8,9,12] E163 [2,5,6,11,12] E160a [3,8] E132  E140 ). Flavours: 1 lemon, 2-pink grapefruit, 3-orange, 4-strawberry, 5-blueberry, 6-berries, 7-czrna currant, 8-mango, 9-melon, a 10-lime, 11 grape, 12 -arbuzowy, 13 green apple. Smaczne vitargo, dobrze rozpuszczalne i wydajne, polecam!